Two Washington ferry workers received the Life Ring Award for their work rescuing a man swimming across Sinclair Inlet. BREMERTON – As the Walla Walla came in to dock in Bremerton during an evening sailing in August, crew members spotted the man swimming across Sinclair Inlet, waving and fully clothed. They quickly reported the sighting, halted offloading operations and launched a rescue. “Your training kicks in, and it just comes almost like a reflex,” said James Patheal, who hopped into the rescue boat with fellow crew member Donna Phillips. The man, who had gone missing after last being seen at Kitsap Mental Health in Bremerton, at first told Patheal and Phillips he didn’t want to be rescued, but the two maintained their position nearby. Eventually, the man welcomed their help and the two crew members hauled him into the boat, likely saving the man’s life. Capt. Michael Balding gives James Patheal Washington State Ferries a coin after presenting him a Certificate of Merit in a ceremony on the south-side of the motor vessel Kaleetan while en route to Seattle from Bremerton, Dec. 3, 2018. 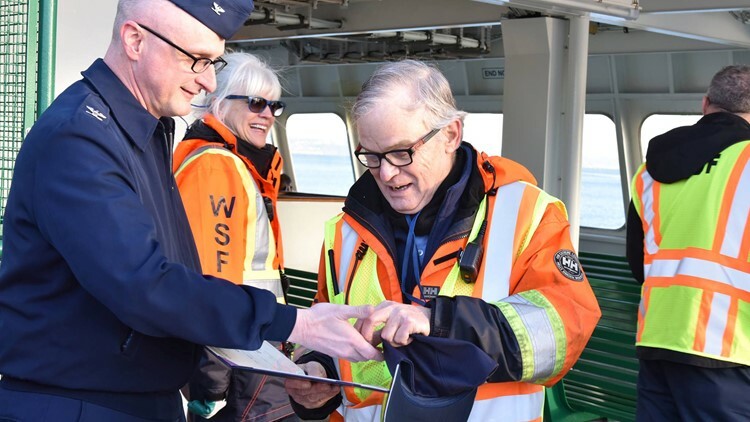 On Monday, Washington State Ferries and Coast Guard representatives honored the Bremerton crew for their work saving the man’s life, with Patheal and Phillips receiving WSF’s Life Ring Award. “You guys put your life on the line, you go out there and you make sure that the public is safe and there’s no greater honor than that,” said WSF Chief of Staff Elizabeth Kosa, addressing crew members at a ceremony. Crew members also remembered their friend Deborah Sabatini — among the first on the Walla Walla to realize the man needed help — who died in November after a battle with cancer. Kosa credited crew members for their attention to training in being ready for incidents like the one in Sinclair Inlet. 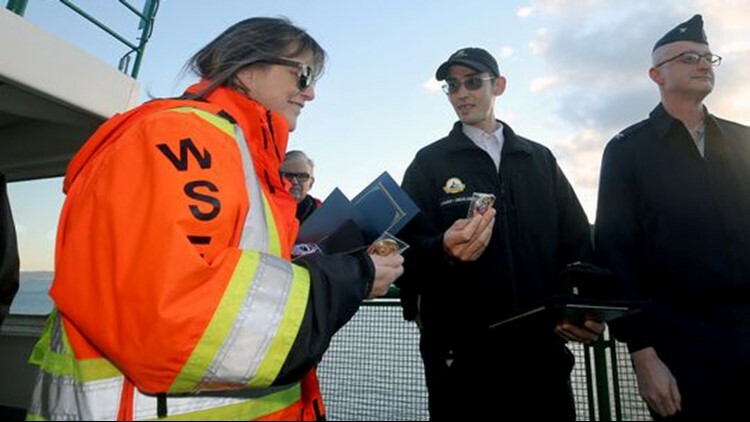 Washington State Ferries workers Donna Phillips, left, of Port Orchard, and James Patheal, center, of Bremerton, look at Coast Guard coins awarded to them on Monday. "These folks are so well-trained," she said. "They know how to act, they know what to do."